Saying goodbye in Togo was a little easier than in Benin. First of all we had not been there nearly as long and secondly our schedule there never allowed us to get intimately acquainted with a lot of the members. We attended Lomé Branch on Sunday because I had not yet finished the midyear audit. President Sessi again invited us up to give our parting testimony. Lomé Branch now has their new benches finished and they look really nice. I suppose if you compared them to the benches that adorn most U.S. chapels they might be considered crude but they are well made, look good in the Lomé chapel and should last the saints there for many years to come. I did not make a count but I am sure there were probably at least 150 in attendance. It was reported later that there were 194 in attendance at Tokoin and more than 70 in Hedzranawoe so the church and the activity continues to grow in Togo. On Sunday afternoon Soeur Black and I fairly well collapsed and just enjoyed the afternoon and evening of our last Sunday in Africa. On Monday and Tuesday we finished delivering the chalkboards, AV stands, TV’s and CD players to all of the chapels. Every chapel in Lomé and Cotonou now has a nice set up for playing CD’s to assist in teaching. We have tried to remember each missionary on or around his birthday and the last one before we left was for Elder Bowman. 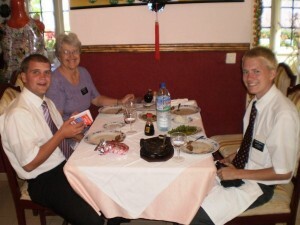 We did cheat a little though and took him and his companion to a Chinese restaurant instead of a home cooked meal. They did not seem to mind and it was easier at a time when there was no food left in the house! We also invited all of the Lomé missionaries over on Monday for a little going away cake and ice cream. 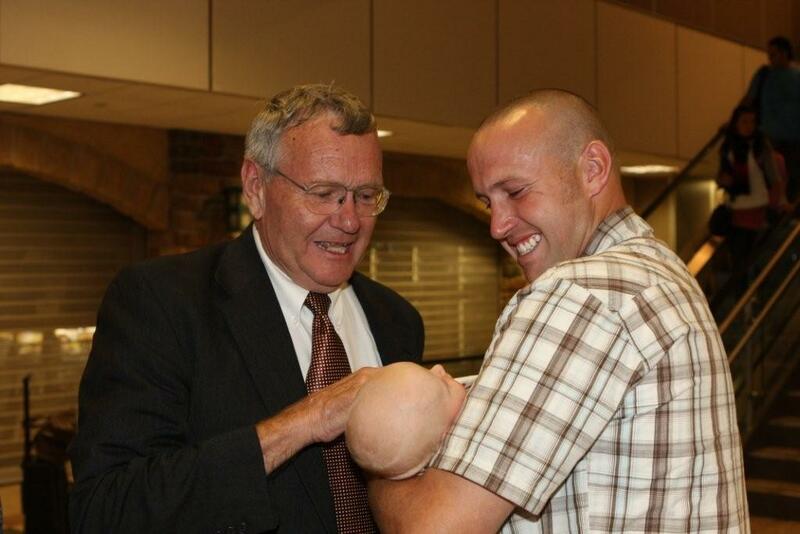 That was nice and it turned into a little tearful farewell from some of the missionaries. I think they are most sad to see Soeur Black’s cooking slip away but we really have formed a good bond with many of these missionaries and appreciate them a lot. We will truly miss them! On Wednesday, Blaise called us a taxi as soon as all of our bags were ready and Blaise, (our guardian and expert at crossing the border), former Elder Missigbeto who came over to go on to Accra to the temple with us, and Soeur Black and I crowded into the small taxi with all our suitcases to begin the journey to Accra. After seeing all those overloaded taxis for a year and a half, this time we were the overload. Arriving at the border we were immediately surrounded by a number of women offering to carry the luggage through the border. Blaise chose three, each of whom put two suitcases (about 100 lbs) on their head and started across with us hurrying to keep up. A half hour and a few filled out forms later, we were on the Ghana side, found a taxi and headed for Accra. Ghana in general appears to be more progressive than Togo and Benin. This is perhaps not true if you get out of the city but Accra is quite a bit like an American city complete with a freeway. 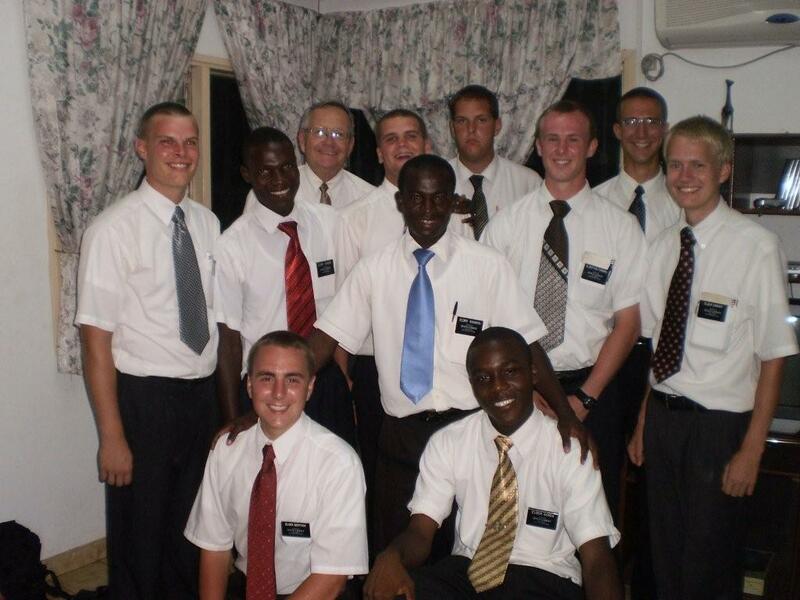 President and Sister Harmon had invited us to stay at the Ghana MTC. It is located in Tema, about 15 miles before you reach the City of Accra. We arrived early afternoon and were warmly welcomed. We spent the evening there mostly just relaxing and enjoying the beautiful apartment which is much like a very nice condo and something we had not seen for many months. President and Sister Harmon had just shipped off a group of over 60 missionaries and they were also relaxing and of course tending our needs. The group included two elders from Togo and one from Monticello, Elder Butler, whom we had hoped to see but missed by about an hour. On Thursday, Sister Harmon drove us into the temple and we attended a session. In the session were President Gbedjangni, Desire and Soeur Vivian from Cotonou. Also Soeur Pascaline was going through for her own endowment. There was also a couple from Togo. It was a nice to attend the temple with some people we knew. The room was almost filled and Soeur Black and I were the only white faces in the session. Afterward, the Cotonou folks did some baptisms and asked me to do the baptizing. The Accra temple is beautiful all done in beautiful African woods and stained glass windows in African designs and colors. Such a change from the outside world. The African members look striking in their white clothing against their black faces. It was a very fitting and wonderful end to a mission. You have heard of the longest day. We had one on Friday. The flight from Accra to New York is 11 hours but another 3 are required for check in, boarding etc. Our stay in New York was a couple of hours and then another 6 hour flight (including the world’s longest taxi before takeoff) to arrive in Salt Lake City. The trip was largely uneventful except that Elder Black got a little sick and we left the camera on the airplane in New York. The camera had been dropped anyway and we did not feel especially bad about losing it but our blog will be missing a couple of pictures of Ghana and the temple. 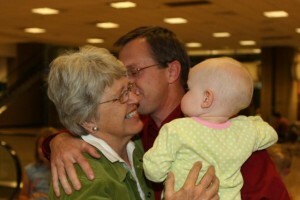 We arrived in Salt Lake City to our much anticipated reunion with family just a little before midnight. 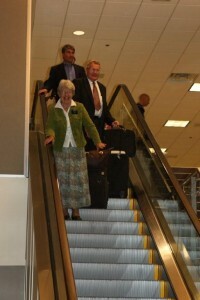 The reunion at the bottom of the escalator was all that we had anticipated it would be. 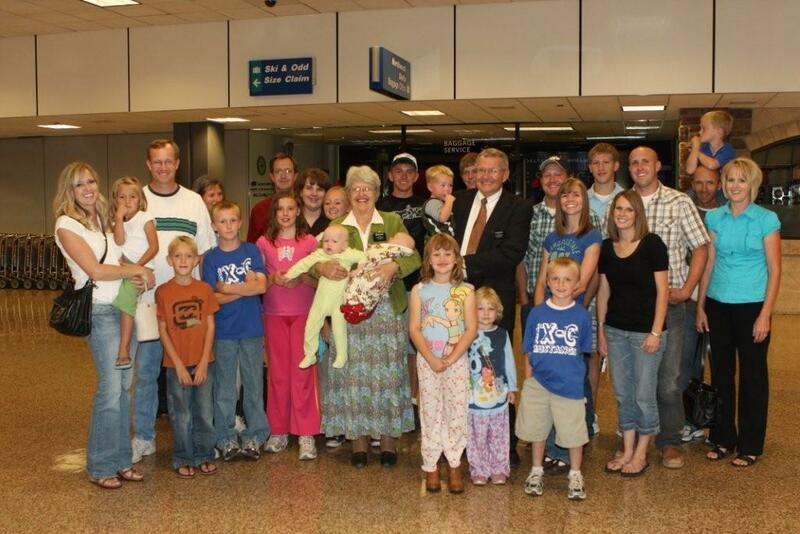 All of the grandkids except 3 who just couldn’t wait up that long were there with hugs and kisses a plenty. 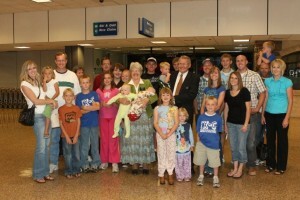 Also the Southams and Elder Phillips had waited up for our arrival. Thanks to all for this effort. 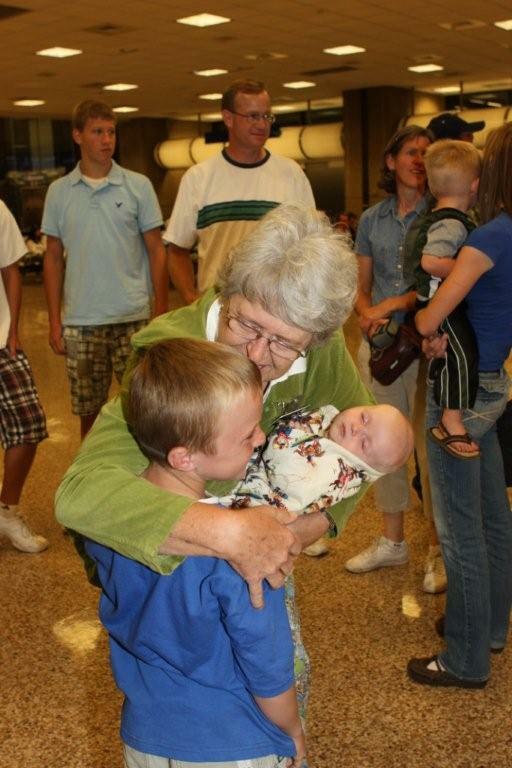 We think it may be worth serving a mission just because of the fun of coming home to a grand reunion with family and friends. After a wonderful weekend at Jody’s house in Pleasant Grove with all the family except for Tony and Kerry and children (they live in Kansas and will be coming next week), we returned to Blanding on Sunday evening where we were released from our mission by President Redd. As we look at our mission in retrospect, we experienced everything from the exhilarating to the frustrating to the spiritual. We worked hard and tried to serve the Lord to the best of our ability. We prayed daily that we might know how best to serve Him, the members and the young missionaries. We know without a shadow of a doubt that the gospel was restored in its fullness by a loving Heavenly Father so we might have the privilege knowing his plan of salvation and live with our families again when we return to our Father in heaven. The gospel of Jesus Christ changes lives. We saw it happen again and again in Africa as people accepted it and were willing to live a Christ-like life. Thanks to all who have shared with us our experiences in the small countries of Benin and Togo in the big mystical place called Africa.